I’m no stranger to a miter saw and repurposed wood, but sometimes the mess, added weight, and splintery texture of real wood just isn’t the best way to finish out a project- especially given the toxicity of repurposed pallet wood. 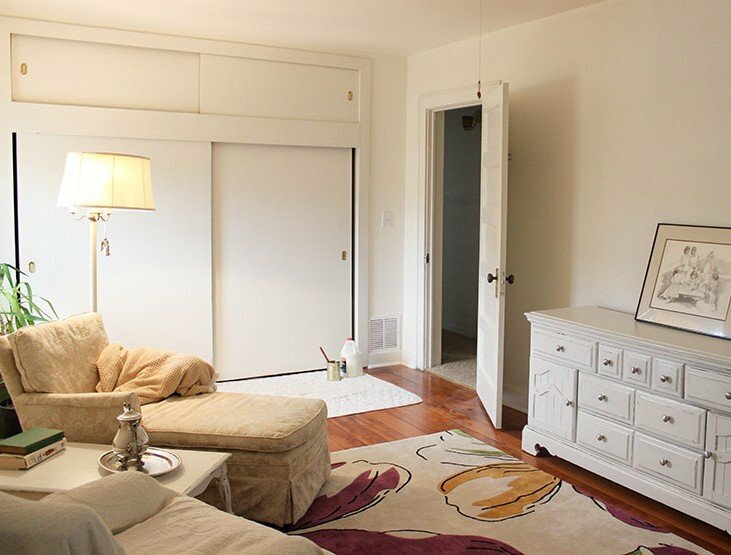 My friend Merre and I spent weeks tossing around ideas to easily update a closet with old sliding doors. 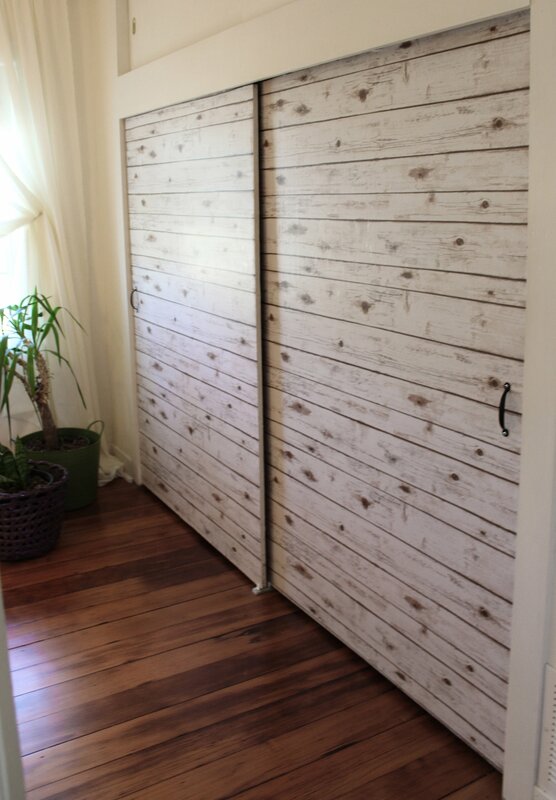 Open shelving, replacement with old doors, and even resurfacing with distressed metal were considered until we came up with the perfect, cheap solution: using giant pieces of photo backdrop paper (printed on XXL paper with no seams or pattern repeat) to add the look of barnwood shiplap without adding any additional weight or thickness to the closet doors. The smooth whitewashed wood surface adds interest and texture to the room while still reflecting lots of light back into the bright white room. 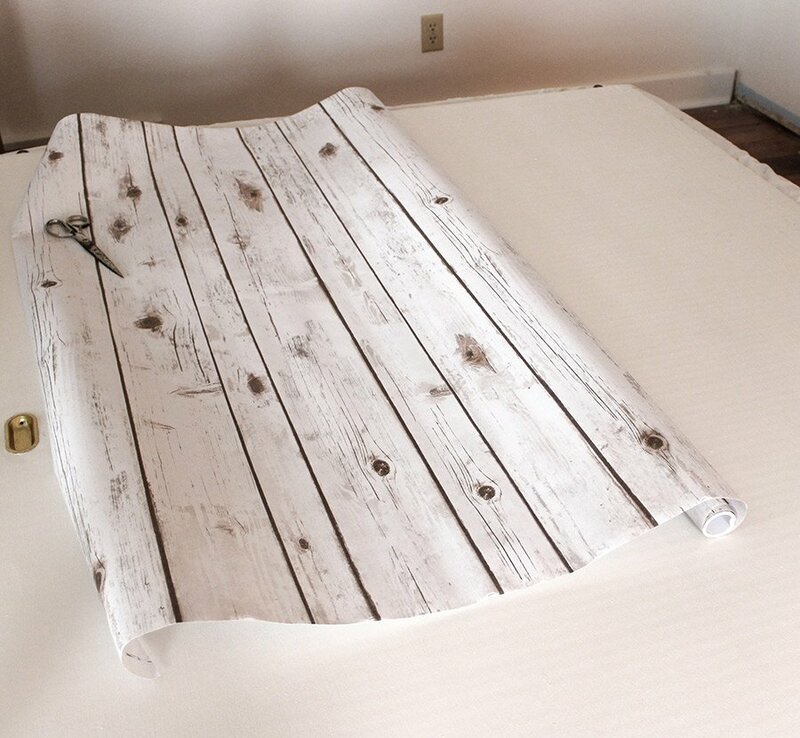 Plastic Smoothing Tool – a flexible wallpaper smoother is NOT an optional tool! 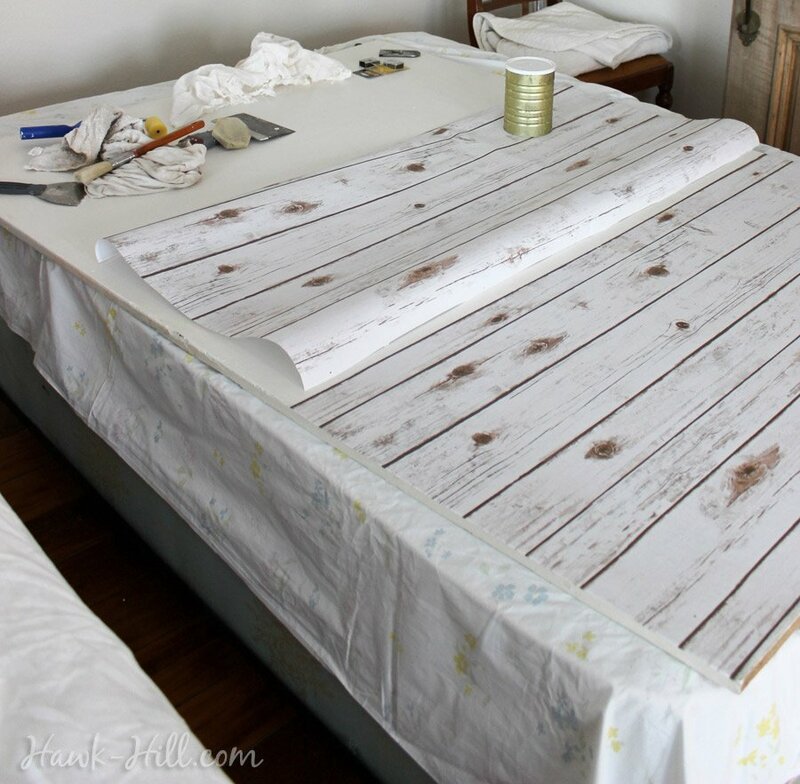 This project uses very thin paper- which works great EXCEPT the paper, once wet, will tear very easily if smoothed with a basic straight edge or scraper. Dilute the Elmer’s Glue. 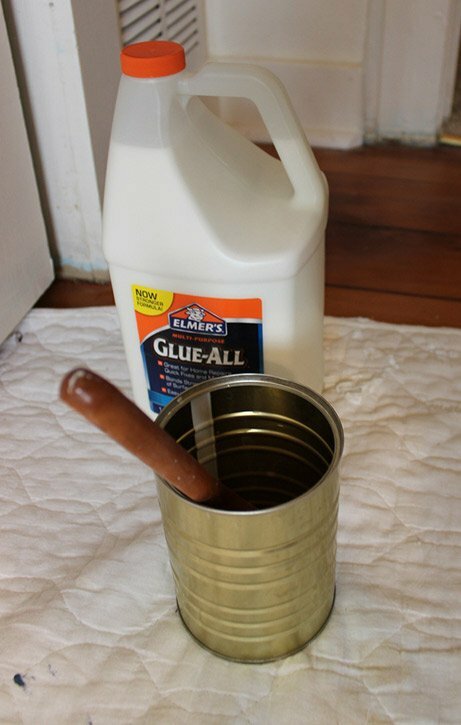 The Elmer’s Glue website suggests diluting their glue for decoupage by mixing 3 parts glue with 1 part water. 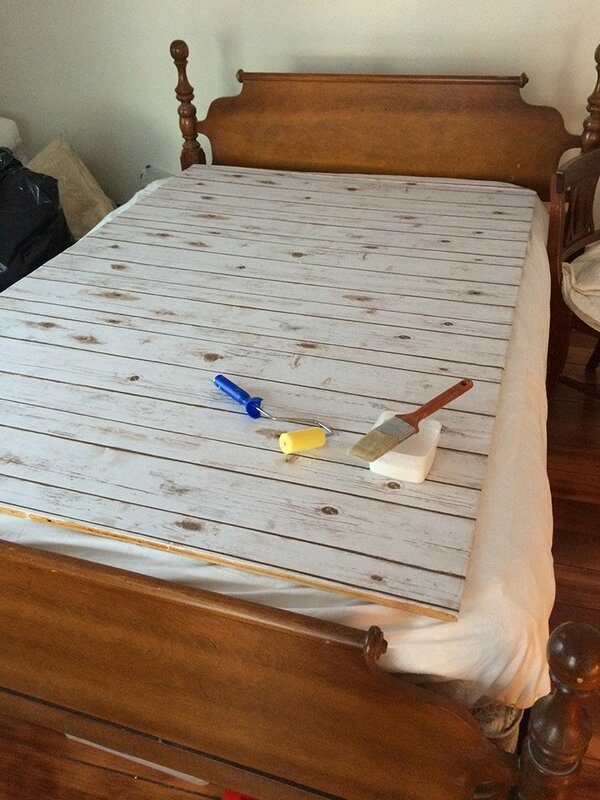 This formula worked great on this project and was much easier to paint on and apply thinly than pure glue would have been. 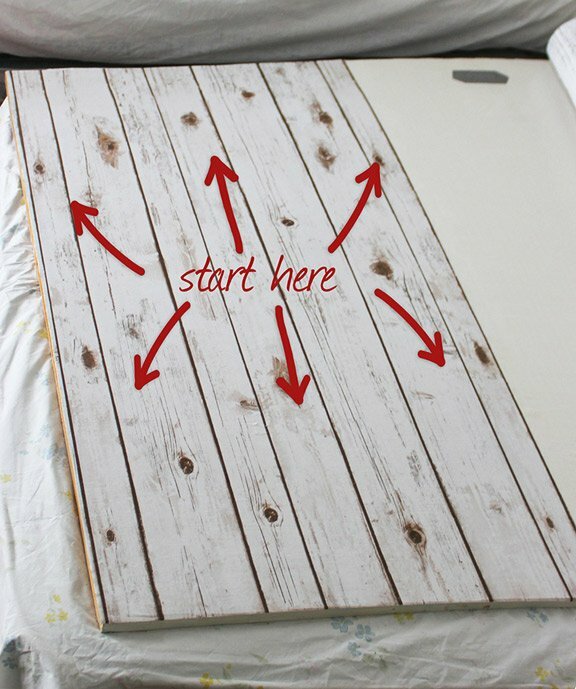 Remove the door and lay it down on a horizontal surface. 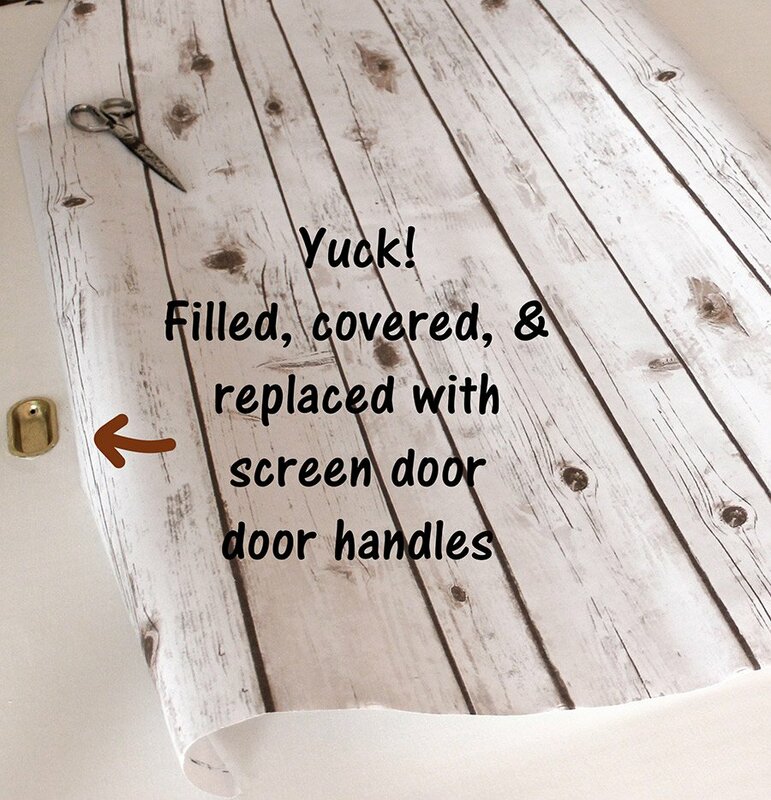 Remove any hardware from the door. In our case the handles were recessed so we had to remove the hardware and then fill the hole before applying the paper. We learned (the hard way!) that it’s helpful to cut the paper into smaller, manageable pieces. (Don’t worry, seams won’t show!). 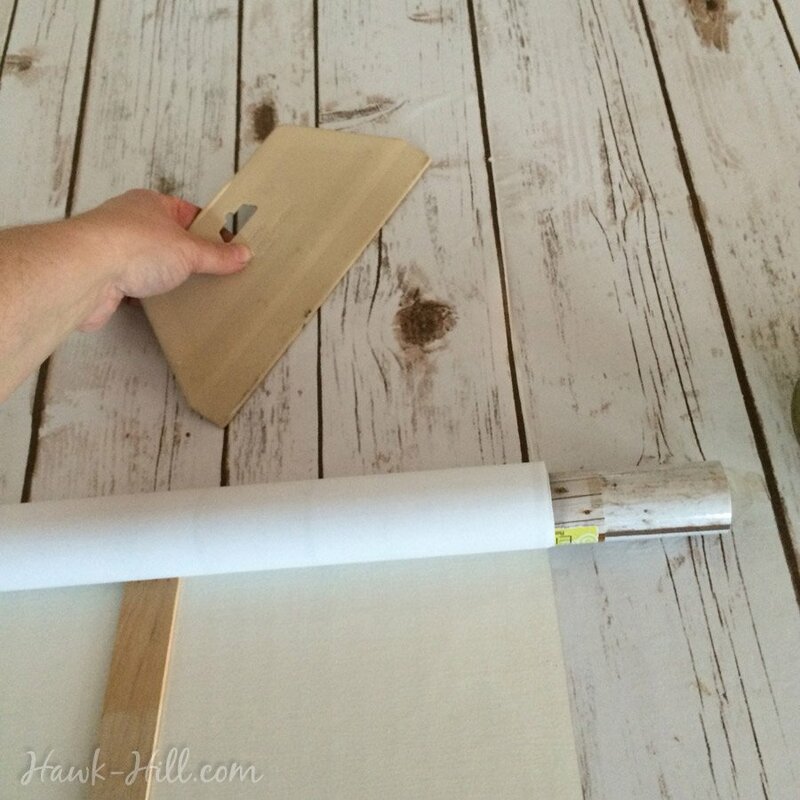 Pieces of paper 4ft wide (the full width) by 24-36″ were the easiest to handle. Begin in the center and work towards the edges. 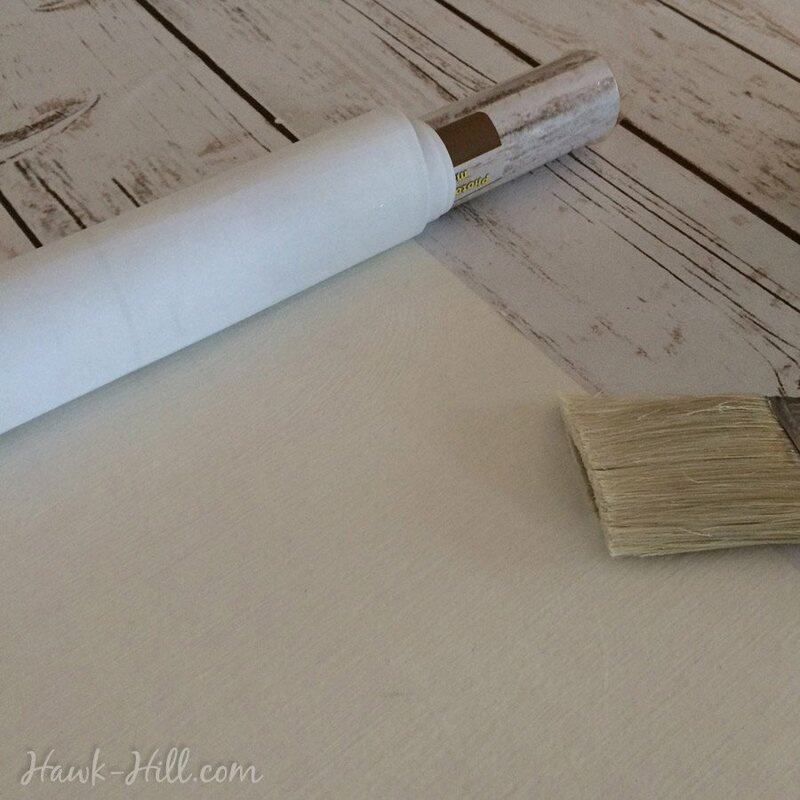 Don’t worry if you end up with a little extra on the edges- the wet paper will stretch as it is smoothed. Line up the paper just right, then add weight to hold it in place. Pick a side and roll the paper up from the outside towards the center. 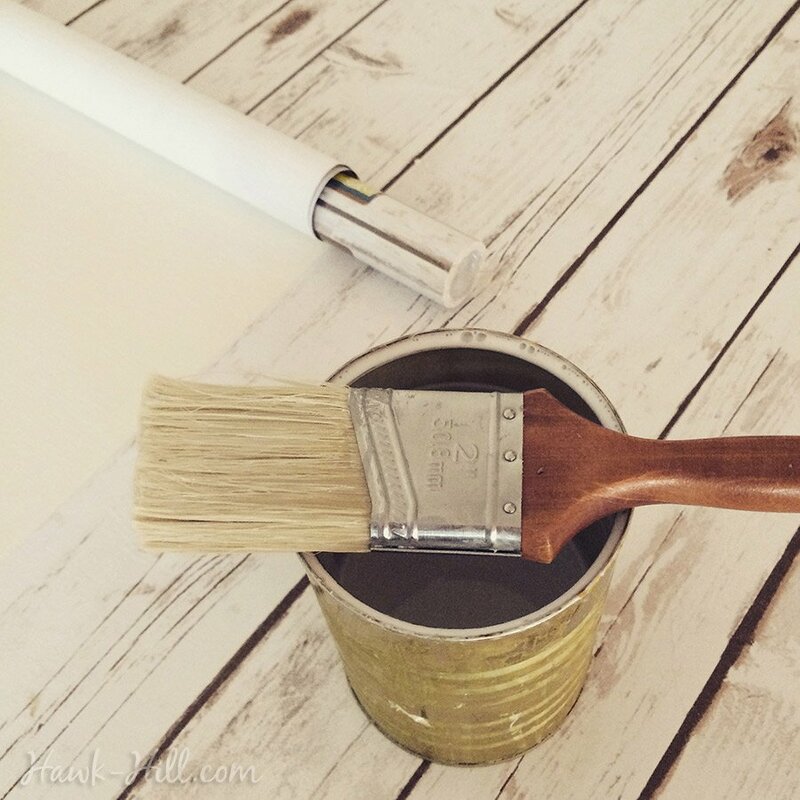 Add a moderate amount of glue to your brush and spread a thin, even coat across the width of the section, but working in sections no more than 6-8″ long. IMPORTANT: Do not use an excessive amount of glue. The more moisture you add the more likely the paper is to fully saturate and tear when being smoothed- so you want just enough glue to get the paper to adhere. 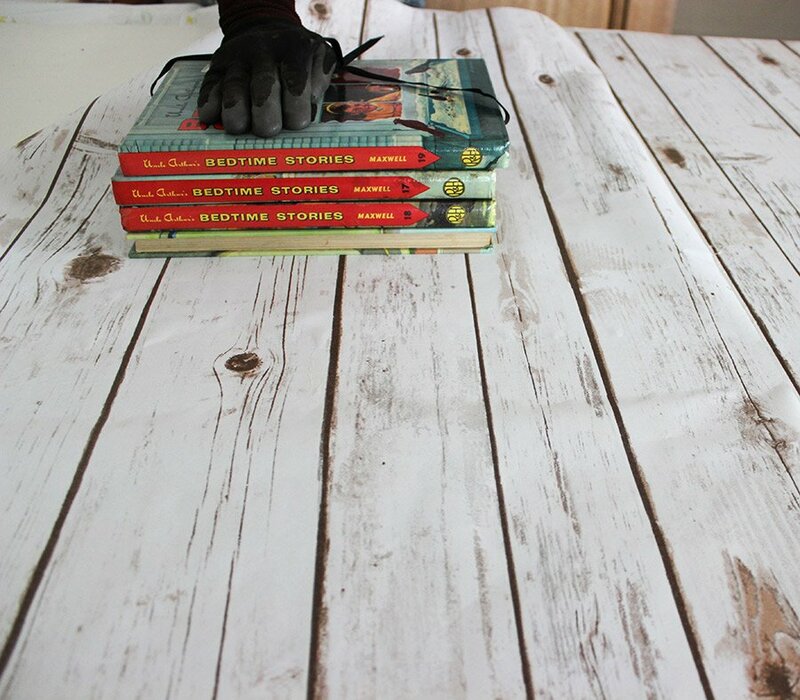 Once one side is fully adhered, remove the books that were weighting the center, roll the loose side up until you reach the beginning point of where you’d previously glued, and repeat steps 4 & 5, working your way down this side. Step 7. Once you get the hang of how much glue to use and how the paper smooths best, this project goes quick! For each section, simply line the top edge up with where the last section ended, weight the center, and continue gluing small sections at a time. 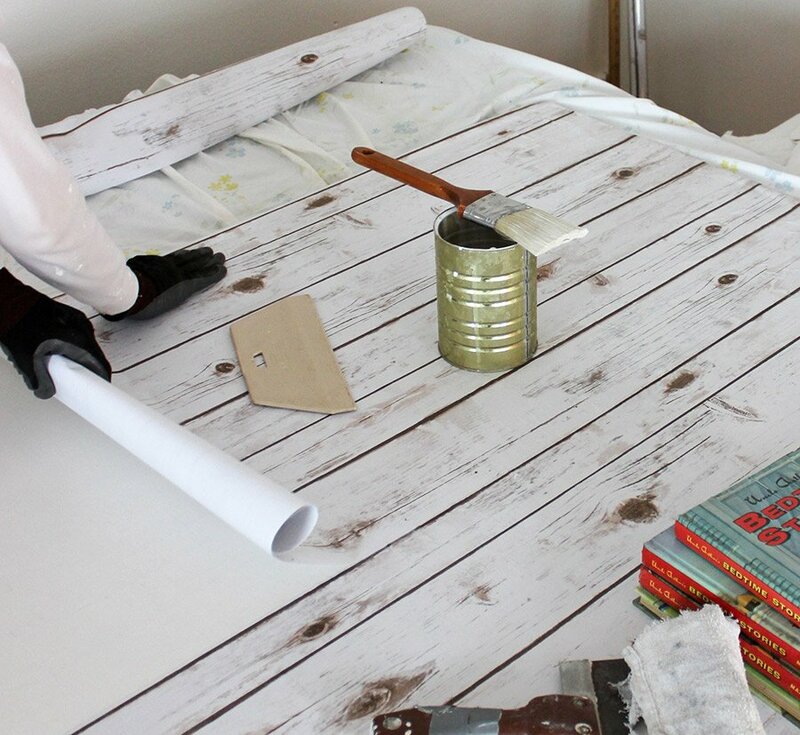 When you are done applying the paper to the entire surface- let the glue dry completely- at least 4-6 hours before applying a top coat to seal the paper. 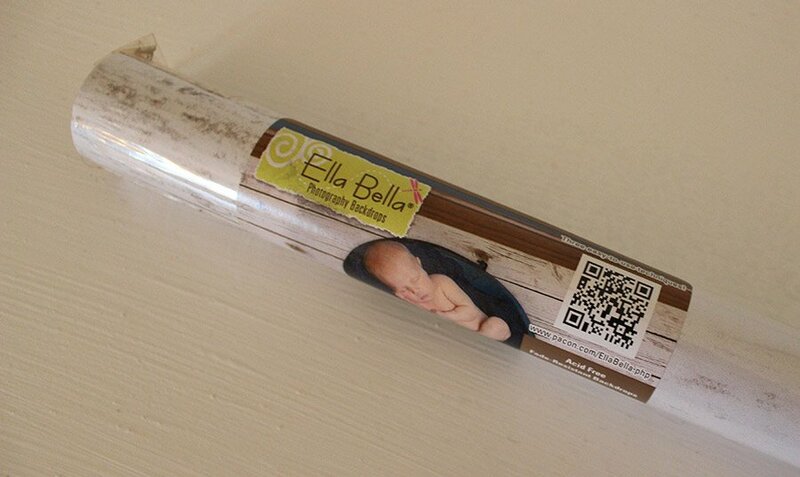 You’ll want to seal the top of this paper so it can be wiped clean when it gets dirty fingerprints and dust. 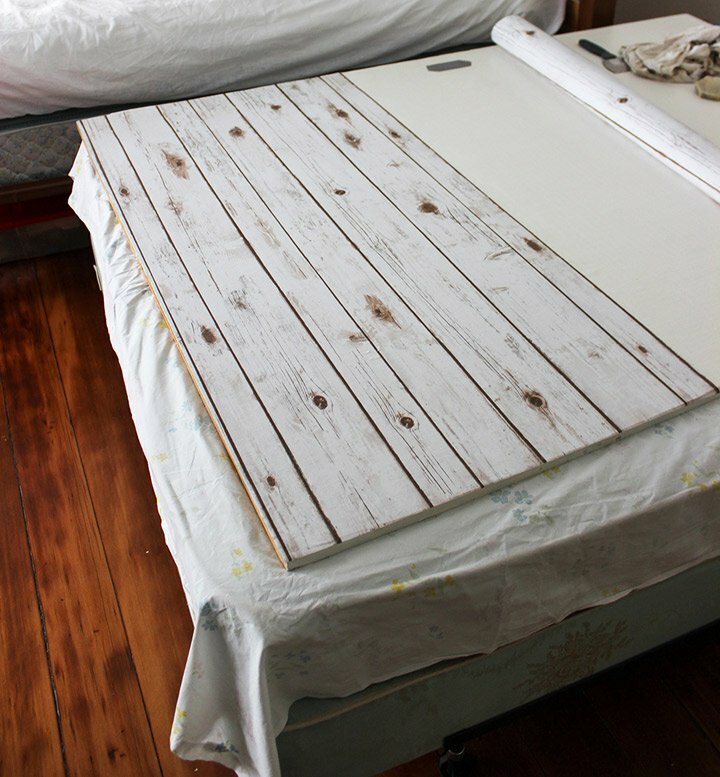 IMPORTANT: Be sure and use a sealer with a MATTE finish. 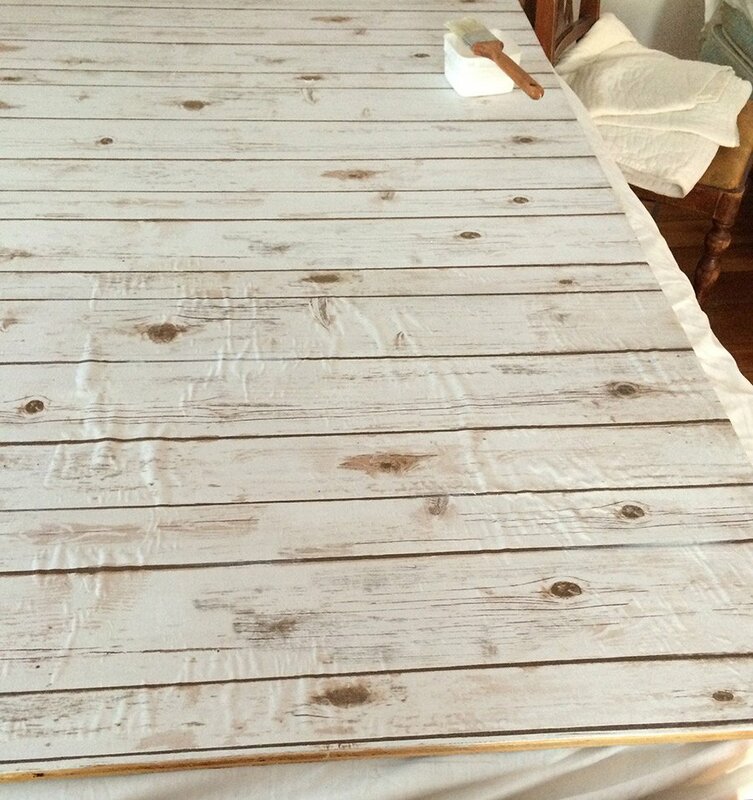 A glossy or semi-gloss finish will make the surface look flat and slick, ruining the barn wood look, so you’ll need to use matte finish Mod Podge or matte finish Glazing Medium (the artist’s equivalent of the former) Don’t panic if the wet sealer makes the paper buckle. Ours did, but after drying the paper was again flat. The moment of true and complete panic when the first coat of Mod Podge was applied and this happened, but thankfully as the paper dried it smoothed again completely. My photos just don’t do this project justice! I will keep looking for better light and a better angle to catch a shot of these doors! 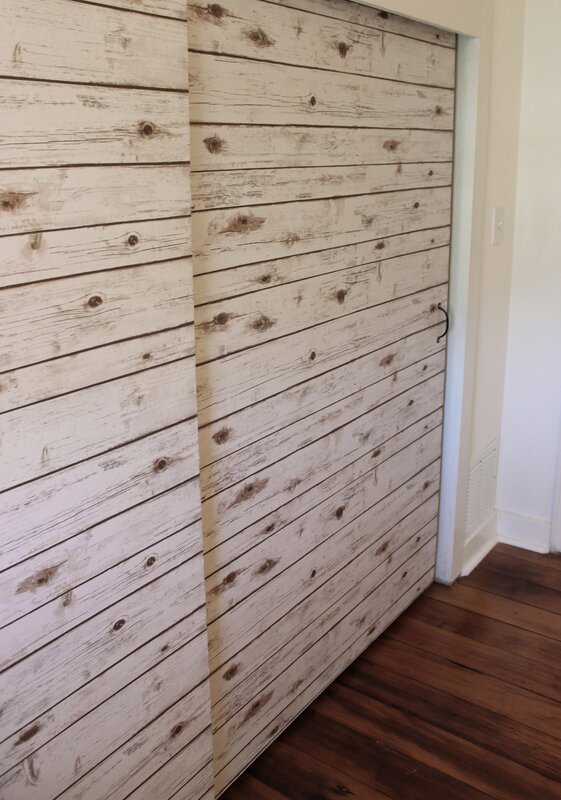 And here’s a shot of the other end of the same room- where the branches placed behind the headboard make a perfect companion to the faux barnwood doors. 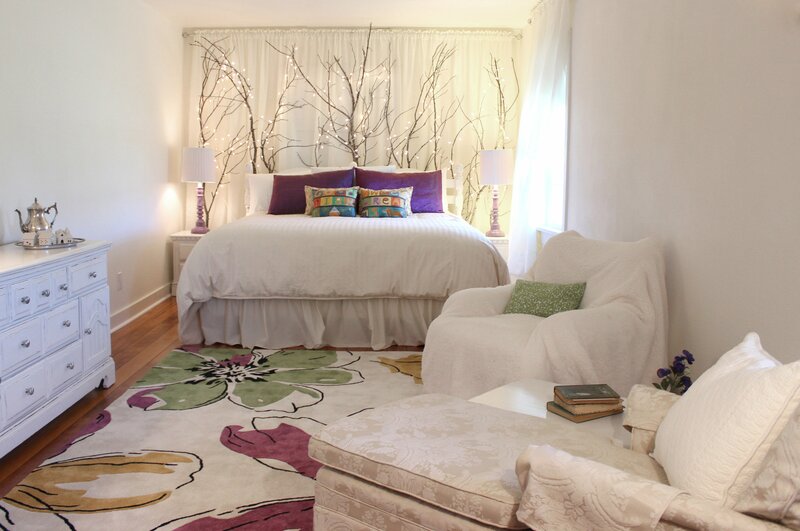 Love this room? You can book it for the night- see the Stirling House on Air BnB. Can this be done on a wall?